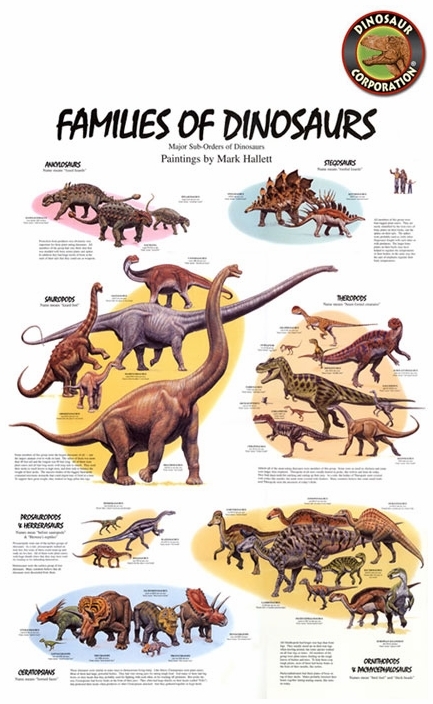 Beautifully painted by famed paleo-artist Mark Hallett, this dinosaur poster shows representative members of dinosaur groups. Size 27 inch x 19 inch. Ankylosaurs name means "Fused Lizards" Euoplocephalus, Saichania and Hylaeosaurus, Protection from predators was obviously very important for these plant eating dinosaurs. All members of the group had very thick skin that was studded with bony armor plates and spikes. In addition they had huge knobs of bone at the ends or their tails that they could use as weapons. StegosaurusName means "Roofed Lizards" Stegosaurus and Kentrosaurus. All members of this group were four-legged plant eaters. They are easily identified by the twin rows of bony plates on their backs and the spikes on their tails. The spikes were probably used as clubs when Stegosaurus fought with each other or with predators. The larger bony plates on their back may have helped to regulate the temperatures of their bodies, in the same way that the ears of elephants regulate their body temperature. Sauropods Name means "Lizard Feet". Saltasaurus, Camarasaurus, Mamenchisaurus, Ohmdenosaurus and Brachiosaurus. Some members of this group were the the largest dinosaurs of all - and largest animals ever to walk on land. The tallest of them was more then 40 feet tall and the longest was 90 feet long. All of them were plant eaters and all had long necks with long tails to match. They used their necks to reach leaves in high trees and their tails to balance the weigh of their necks. The massive bodies of the biggest Sauropods contained enormous stomachs that could digest tons of food at a time. To support their great weight, they walked on huge pillar-like legs. Prosauropds & Herrerasaurs Names means "Before Sauropods" & Herrera Reptiles". Riojasaurus, Plateosaurus and Herrerasaurus. Prosauropods were one of the earliest groups of dinosaurs. As a rule, Prosauropods walked on four feet, but some of them could stand up and walk on two feet. All of them were plant eaters with huge thumb claws that they may have used for feeding or for defending themselves. Herrerasaurs were the earliest group of true dinosaurs. Many scientists believe that all dinosaurs were descended from them. Ceratopsians Name means "Horned Faces". Styracosaurus, Leptoceratops, Triceratops, Pachyrhinosaurus, Protoceratops, Pentaceratops. These dinosaurs were similar in some ways to rhinoceros living today. Like rhinos, Ceratopsians had horny beaks at the front of their jaws. They often had huge shields on their heads (called "Frills") that protected their necks when predators or other Ceratopsians attacked. They gathered together in large herds. Ornithopods & Pachycephalosaurs Names mean "Bird Feet" and "Thick-Heads". Corythosaurus, Lambeosaurus, Pachycephalosaurus European Iguanodon, Bactrosaurus, Edmontosaurus and Ouranosaurus. All Ornithopods had longer rear legs than front legs. They usually stood up on their legs when moving around, but some species walked on all four legs at times. All members of the group were plant eaters, feeding on the tough leaves of bushes and trees. To help the crop tough plants, most of them had horny beaks at the front of their mouths, like turtles. Pachycephalosaurs had thick plates of bone on top of their skulls. Males probably knocked their heads together during mating season, like rams do today. Theropods Name means "Beast-Footed Creatures". Dilophosaurus, Oviraptor, Tarbosaurus, Archaeopteryx, Coelophysis, Ceratosaurus, Segnosaurus, Gallimimus, Acrocanthosaurus and Deinonychus. Almost all of the meat-eating dinosaurs were members of this group. Some were as small as chickens and some were larger than elephants. Theropods of all sizes usually hunted in packs, like wolves and lions do today. They had sharp teeth for catching and cutting their pray. As a rule, the bodies of Theropods were covered with scales like reptiles, but some were covered with feathers. Many scientists believe that some small feathered Theropods were ancestors of today's birds.